Do you know who else depoliticized early Christianity? Early Christians. Paul. The evangelists. The early Church Fathers. In short, everyone. The story of Jesus’ death, followed by the successful spread of Christianity as related in the gospels and Acts, reminds me of the road across Englewood Dam. The dam, located northwest of Dayton, Ohio, protects the area from flooding by the Stillwater River. 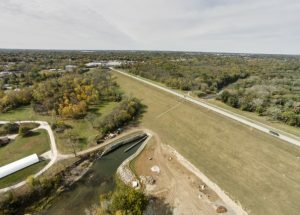 A number of dams in the area, all built after the Great Dayton Flood, have a similar design. The levees on either side are enormous, allowing the reservoirs to retain billions of gallons of water. The first time I drove across the levee, I was struck by how easy it seemed (if not for the guardrails) to veer slightly to the left or the right, tumbling 100 feet down the embankment into the trees. The story of the Passion follows a similarly narrow, but more circuitous path. If Jesus was a rebel, a brigand, then he really was an enemy of Rome. And that just won’t do, will it? However, if Jesus did nothing but teach and heal, then why would Pilate have put him to death? Somehow, Jesus must have provoked someone to cause this chain of events, but who?